If you are pregnant and think you have no reason to visit a pediatrician until your baby is in your arms, you might want to reconsider. In fact, the American Academy of Pediatrics (AAP) recommends expectant parents and families schedule their first pediatrician visit during pregnancy, as an opportunity to start the conversation about immunizations and address other common concerns. Why Schedule a Prenatal Visit to the Pediatrician? There's a lot to gain from setting up a visit before your baby arrives. It allows you to fully concentrate on any questions and concerns, without the task of physically caring for a newborn. A prenatal appointment also allows the pediatrician to get a better picture of the whole family—including medical histories, mental health, lifestyle information, and any high-risk complications or medical conditions that may need more assistance. This initial visit lays the foundation of a long relationship between the pediatrician and your family to establish trust and address any issues that may come up in the baby's life, or your own. William J. Steinbach, MD, a professor of pediatrics and molecular genetics and microbiology and the Chief of Pediatric Infectious Diseases at Duke University, also supports meeting your child's pediatrician before the baby is born to get acquainted early on in the professional relationship. As a father of three children himself, Dr. Steinbach knows parenting can be tough and even pediatricians like him need a support network established early in a child's life. "There is no instruction manual and plenty of trial and error," he says. Fortunately, a good pediatrician can help during those tough times. One of the most common concerns may be your plan for immunizing your child. A prenatal pediatrician visit gives you the time to ask any questions you have and get an expert opinion about the immunizations your child may need and the policies to know. While there are a lot of concerns that can crop up in becoming a parent, Dr. Steinbach says when it comes to vaccines, the pressure is off. He says choosing to get your child vaccinated is one of the easiest decisions to make as a parent, thanks to a well-backed body of research proving both safety and effectiveness. "The good thing is that getting your child vaccinated is probably the easiest thing to do as a parent," Dr. Steinbach says. "Every vaccine goes through extraordinary testing, even more than FDA-approved drugs. There are teams of scientists and physicians who review all the data in great detail from multiple studies and clinical trials before a vaccine is approved for use. Expectant parents have a lot to think about, but whether to prevent potentially deadly illnesses in their child is not one of them. The choice is very easy and countless experts have already defined the best approaches." Dr. Steinbach says while you can and definitely should discuss any concerns you have about vaccines with your child's pediatrician, you can also be reassured to know all pediatricians follow a standard immunization schedule for babies that is set to deliver the safest vaccine at the correct time for optimum protection. While parents may have heard of parenting "trends" such as spacing out vaccines, Dr. Steinbach urges parents to talk with a pediatrician about why following the recommend vaccine schedule is so important. "The vaccine schedule is defined to optimize immunologic response, so spacing out only harms your child by delaying the protection that is needed for a young child," he says. "Just like there are national guidelines to get a mammogram or a colonoscopy, guidelines based on rigorous study and the best medical opinions, vaccines are spaced the way they are for a scientific reason to maximize benefit for your child." It might also be helpful to remember there is only one vaccine that newborn babies receive, so you don't have to be overwhelmed thinking of "all" of the vaccines that your baby will need. The only vaccine your baby will receive in the newborn stage is the Hepatitis B vaccine, which is often given before your baby goes home from the hospital or by the pediatrician. No other vaccines are given until your baby reaches two months of age. 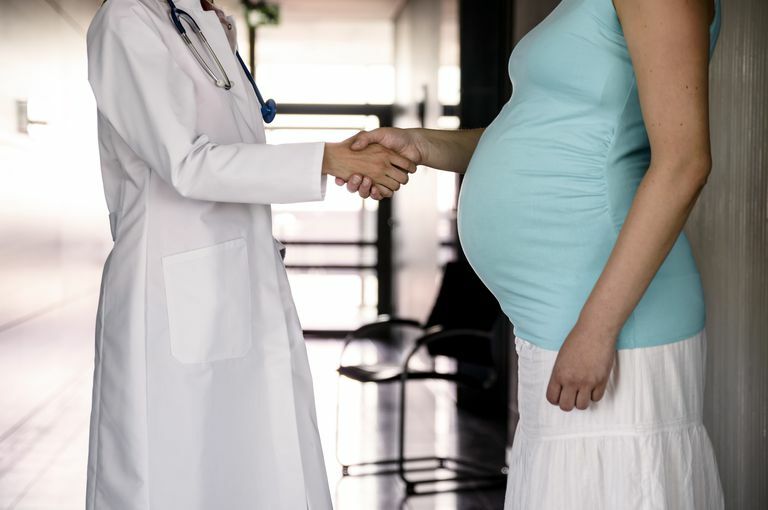 The prenatal pediatrician visit can also be a great opportunity for you and any other individuals who will be involved in your baby's care to make sure that they are up-to-date on your own vaccines. According to current recommendations, all pregnant women and caregivers should receive the influenza (flu) immunization, as well as the Tdap vaccine, which prevents against whopping cough. Come prepared to give the doctor an accurate depiction of you and your family's health and any medical concerns for the child. It is also becoming more common for a pediatrician to discuss mental health with parents. Not only can a pediatrician help assess a mother or family's risk factors for potential mental health disorders, the prenatal pediatrician visit can be a great chance to learn more about identifying postpartum mental health complications. Having a plan in place ahead of time for how you or your family may need help is key. It's often difficult to identify the need for help after a baby is born because the family is so knee deep in newborn care they don't know where to turn. Scheduling a visit with your child's pediatrician during your pregnancy can help you feel more prepared to safely welcome your baby. Among other important preparations, your child's pediatrician can help guide you through the sometimes challenging conversations about the world of vaccines. Vaccines can feel like an overwhelming topic to tackle as a new parent, but sitting down with the care provider, who will be a big part of your child's life, can help break it down into manageable tasks and easy-to-digest information. You can learn what vaccines your child will need in his or her first few months of life, what vaccines you and any partners and fellow caregivers should receive during your pregnancy, and have an opportunity to discuss vaccines in an open environment. Because trust us—it's a lot easier to discuss vaccines in a rational way before you have that hungry newborn in your arms. William J. Steinbach, MD. (2018, April). Email interview.